Around 11 p.m. Wednesday, four inmates cut through jail window bars using tools they obtained in an unknown manner. The inmates then rappelled out of a second-floor cell, using clothing and bed sheets to aid their escape. A deputy noticed clothing hanging from a window, and two of the four inmates were subsequently caught. The other two managed to get away. 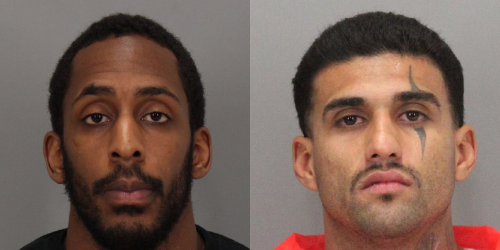 The Santa Clara County Sheriff’s Office says there are no cameras in the section of the jail where the fugitives were living. Sheriff’s officials say that section is older than other parts of the jail and was constructed in the 1950s. “There has never been an escape from Main Jail South in this kind of fashion. Anyone willing to escape from jail is desperate. Don’t try to apprehend them, but notify law enforcement if you see them,” Sgt. Rich Glennon said. Sources from inside the jail told NBC Bay Area it is possible the inmates received help in getting away. The inmates who escaped are Rogelio Chavez, 33, and Lanon Desean Campbell, 26. Chavez is 6 feet tall and weighs 190 pounds, and Campbell is 6 feet 4 inches tall and weighs 210 pounds. Chavez has been incarcerated since Aug. 17 on various charges, including burglary, extortion, false imprisonment, resisting arrest and multiple firearms violations. Campbell has held since Feb. 2015 on charges including robbery, false imprisonment, criminal threats and, likewise, multiple firearms violations. A massive manhunt for Chavez and Campbell is ongoing. Authorities have increased patrols for Thursday morning’s Turkey Trot race in San Jose. Aw…they are calling them “dangerous and desperate” instead of “armed and dangerous”. Isn’t that sweet? Stupid face tattoos: the next best thing to carrying around a flashing neon sign saying, “I’m a criminal”.